Hoenderhok Bock, a dark German-style lager made by craft brewery Stellenbosch Brewing Company was recently announced as this year’s winner of the South African National Beer Trophy Competition. In addition to winning the coveted Beer of the Year award, the same brew also won a gold medal and the trophy for Best Beer in the Amber Category. 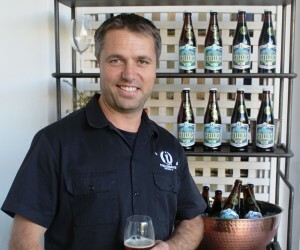 The Stellenbosch-based brewery also picked up a silver medal for their Stellies Mass Hoppiness IPA. Stellenbosch Brewing Company's incredible wins were achieved in a very competitive field - 199 beers entered the competition from 64 breweries across six provinces - and were made even sweeter considering it won over other, more established, brewers like Devil’s Peak, CBC, Darling Brew and Mitchell’s ... and in only their second year of participation in the competition. The National Beer Trophy 2017 is the largest beer competition in Africa and has become the benchmark competition for the beer industry. Judging took more than a month, with the top beers going through a final round of assessment before the winners were announced. A total of four gold trophies, 18 gold medals and 62 silver medals were awarded this year. 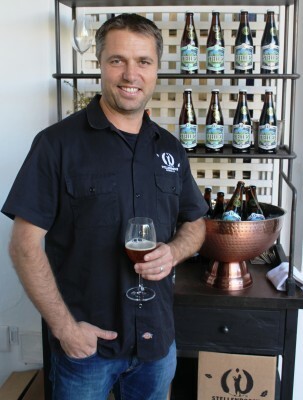 The Stellenbosch Brewing Company officially opened its doors in late 2015. But its story started much earlier: On their many travel adventures, Collins, and his wife, Karen, often found themselves sampling beers from around the world. They were intrigued by the art of brewing and developing great tasting beer. After one such trip, they got involved in a friend’s brew in a basement in Karen’s native Minnesota, USA, which got them hooked on brewing interesting and flavourful beers and they spent the next six years reading, learning, researching and trying (and tasting) many different beer recipes. “I’ve been fortunate that my career as a business strategy consultant has taken me all over the world. But I always knew that I wanted to come home to South Africa and that life in the corporate world was only part of my story,” says Collins. The Stellenbosch Brewing Company started, and is still based, on the Klein Joostenberg farm, outside Stellenbosch. Collins' beautiful copper brewhouse and other brewing equipment (made in the Czech Republic but sourced from a brewpub in South Korea) arrived in Cape Town before the brewery building had been completed. As a result, his landlord allowed them to store everything in an old chicken shed at the back of the farm that was used to store wood and make biltong. Too excited to just leave their brewery in storage like that, Collins set it up in that shed and that’s how the “Hoenderhok Bock” got its name.